Although lacking direct evidence of the first cells, scientists can make some inferences. First, many scientists think that little or no oxygen gas existed on early Earth. Second, the oldest fossils that are thought to be cells are the size and shape of some living prokaryotes. Finally, the first cells might have developed in an environment filled with organic molecules for food. Thus, the first cells were probably anaerobic, heterotrophic prokaryotes. We can reason that a growing population of heterotrophs that depended on spontaneously formed organic molecules for food eventually would have removed most of these molecules from the environment. At this point, autotrophs would have begun to have an advantage. The first autotrophs, however, probably did not depend on photosynthesis the way that most autotrophs do today. If we look for living organisms that may be similar to these early organisms, we find the archaea (ahr-KEE-uh). The archaea are a related group of unicellular organisms, many of which thrive under extremely harsh environmental conditions. Methanosarcina barkeri, the archaeon shown in Figure 14-9, lives in anaerobic environments. Many species of archaea are autotrophs that obtain energy by chemosynthesis (KEE-moh-SIN-thuh-sis) instead of photosynthesis. In the process of chemosynthesis, CO2 serves as a carbon source for the assembly of organic molecules. Energy is obtained from the oxidation of various inorganic substances, such as sulfur. Some forms of life had become photosynthetic by 3 billion years ago. Scientists infer this from a variety of geologic evidence, such as the chemical traces of photosynthetic activity. Also, most of the oldest known fossils of cells are similar to modern cyanobacteria (siE-uh-no-bak-TIR-ee-uh)—a group of photosynthetic, unicellular prokaryotes. Lynbgya, a genus of modern cyanobacteria, is shown in Figure 14-10a. 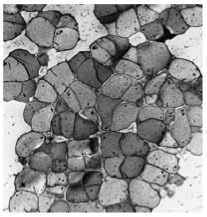 Lynbgya cells often grow in colonies and form layered structures called stromatolites, shown in Figure 14-10b. Fossils of stromatolites as old as 3.5 billion years are known. Oxygen, a byproduct of photosynthesis, was damaging to many early unicellular organisms. Oxygen could destroy some coenzymes essential to cell function. 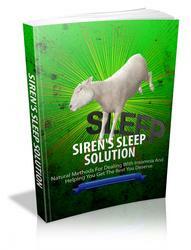 Within some organisms, however, oxygen bonded to other compounds, thereby preventing the oxygen from doing damage. This bonding was one of the first steps in aerobic respiration. Thus, an early function of aerobic respiration may have been to prevent the destruction of essential organic compounds by oxygen. This archaeal species, Methanosarcina barkeri, produces methane during metabolism. Archaea are thought to be similar to the types of cellular life that first populated Earth about 4 billion years ago. Most of the oldest known fossils of cells are similar to modern cyanobacteria, such as members of the genus Lygnbya (a). 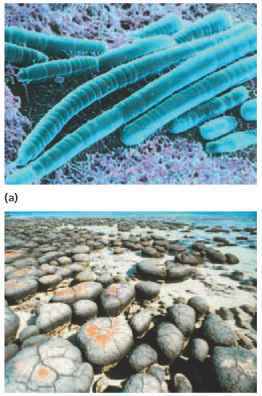 Cyanobacteria such as these sometimes form large colonies that grow in layers and form stromatolites (b). According to the theory of endosymbiosis, large prokaryotic, unicellular organisms engulfed smaller prokaryotic, unicellular organisms. Engulfed prokaryotes eventually gave rise to modern mitochondria and chloroplasts, which carry their own DNA and replicate independently from the rest of the cell that contains them. Word Roots and Origins endosymbiosis from the Greek endon, meaning "within," syn meaning "together," and biosis, meaning "way of life"
Why do most scientists think the first cells were similar to today's archaea? Why most scientists think the first cells were similar to todays archaea?